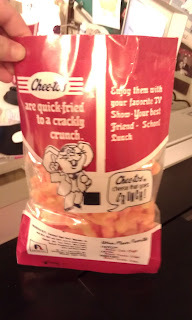 Actually, in this case, it's REALLY easy bein' cheesy. These are for our upcoming production of 'Assassins' and they were a hoot to make. The actress will be eating out of the bag- but she prefers to eat something that won't leave cheesy orange powder all over her costume and props. Can you blame her? 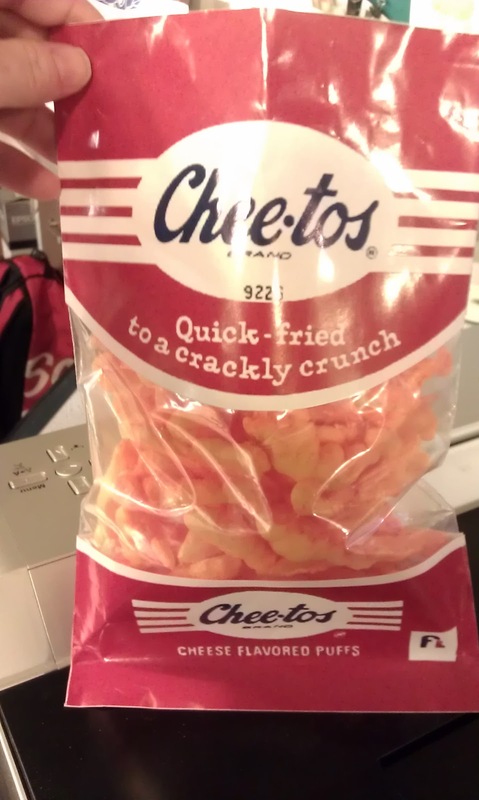 Cheetoes are delicious, but you have to be committed to orange. Our solution is a double layered bag. Jill Lyons, prop graphics artist extrordinaire, created our vintage bag. 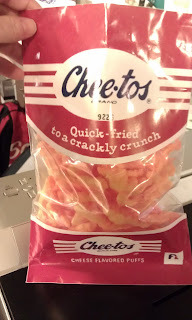 This, we stuffed with a layer of fake Cheetoes, and nestled a clean plastic bag inside to act as a nest for the edible snacks. These are incredibly simple to make. 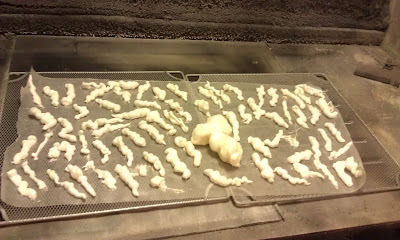 I used our Hilti foam gun to make tiny strings of foam on aluminum foil , which I then allowed to cure in our spray booth. Ignore the blob in the middle, I was playing with sprayer setting. Hey, I said to ignore it! 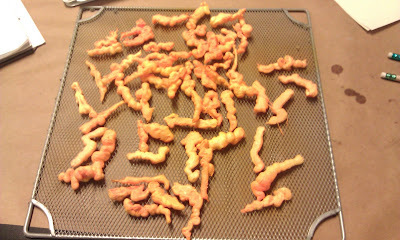 Once the stringies were cured, I used Design Master spray paints to make them look cheesy. 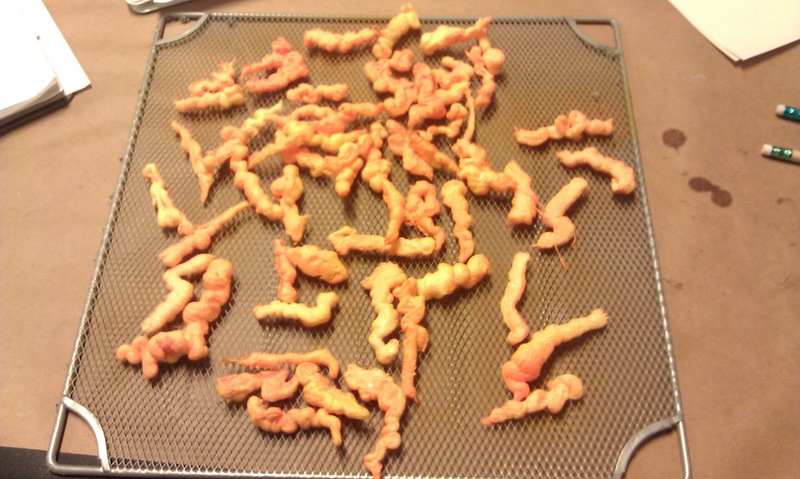 I first used a layer of yellow to make the corn curl color, then hit them with orange for the cheese powder. That's it! This is yet another one of those food props that is sold by it's packaging as much as its substance. What will she actually be eating? I would have suggested some other kind of extruded corn curl, but really the key is to give the actress what she's comfortable with- and bugles is what she wanted. Likely, only the first few rows could tell if they were looking- and if they're looking, the focus is in the wrong place. What did you use to make the bag? What kind of material is that? I needed to make a bag of vintage English "Crisp Chips" for the Dumb Waiter and didn't know what to use. I ended up just using a small brown bag that Shredded Wheat comes in and creating a vintage label from Photoshop. Looked good but I would have rather used a clear bag like you have here. We found plastic snack bags that were the correct size. Then, Jill printed the opaque parts of the label onto adhesive photo paper, which she cut out and stuck onto the bag. You can get crinkly cellophane bags in stores that sell candy making supplies. I hope that helps! Awesome! I was just needing to make a vintage bag of pretzels. Your Cheetos bag looks great! I will have to search out something larger that a snack bag though. Any suggestions? Yes, check with floral supply stores for larger, clear bags. Otherwise, you could fabricate your own out of cellophane and double stick tape. Sadly, no. But look how easy it is to make your own!